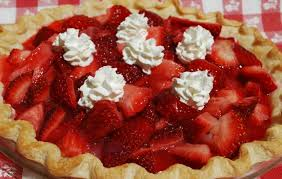 Cape Breton Tourism Spotlight: Strawberry Pie Cape Breton Style. There is nothing that I like better during the summer that fresh strawberries, served up in a bowl with whipped cream or made into strawberry shortcake. But this recipe was just given to my husband and I had to try it. It is delicious, so I want to pass it along to you and I have to thank Lori for passing the recipe on to us.